Two sisters celebrated their 102nd birthday today as officially the oldest twins in the world – and were determined to spend it together. 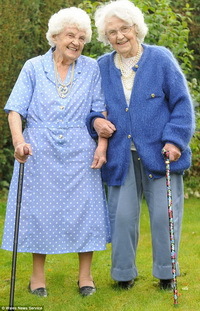 Ena Pugh and Lily Millward, who were born on 4 January 1910, have always shared their big day with each other. Lily was yesterday laid up in hospital with a broken hip – nevertheless, she had one special visitor when her twin Ena called to wish her happy birthday. The pair were given 102nd birthday presents of copies of the Guinness World Records book by their family so they could see their own entry. Lily’s proud daughter Dianne Powell, 65, told Wales News Service: ‘My mum’s recovering in hospital after she slipped and fell just before Christmas. But she’s in good spirits and enjoying the attention of being one of the world’s oldest twins. Farmer’s daughters Ena and Lily were born before the outbreak of the First World War when Queen Victoria’s son Edward VII was king. The pair, who still live in their own houses near Brecon in the Welsh countryside, meet up for weekly shopping sessions and chat on the telephone virtually every night. Their family had no idea Ena and Lily were the oldest twins in the world until a pair in France claimed the record. But checks showed Ena and Lily were more than three years older. Mrs Powell said: ‘They have been very close all their lives and they are still very close now. ‘Until my mum’s accident they would jump on a bus on their own every Friday so they can go shopping together and have a chat over a cup of tea. Ena was born first, with Lily a few minutes later, on a chilly day in January 1910 in their family farm cottage in the tiny village of Garthbrengy, near Brecon in mid-Wales. 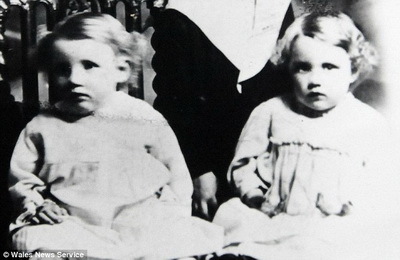 Their parents, Charles and Laura Thomas, had ten children – including twin brothers – but Ena and Lily are the only survivors. Ena married railwayman Ivor who died more than 20 years ago. She still lives in her country cottage where she raised their three children – and now has ten grandchildren and three great-grandchildren. Lily lives in a smallholding and has been a widow for nearly 20 years after the death of husband Evan, a former timber merchant. She had two children, five grand-children and nine-great grandchildren. Both of the twins shun some of the luxuries of modern life – neither has central heating in their home. The sisters live just a dozen miles away from each other in the fresh air of the Welsh countryside – Ena at Erwood, near Builth Wells, and Lily still in her home village of Garthbrengy, near Brecon, but in a different house. The pair believe the last time they were separated on their birthday was due to illness when they were both 79. So they were determined to see each other for their big day yesterday. The sisters spent half an hour together at Lily’s bedside in Nevill Hall Hospital, Abergavenny, where they each had a slice of birthday cake. I wish Lily and Ena well. Didn’t see if they were fraternal or identical. To me they look like the latter. Much more importantly they look happy. I wish them well. Happy Birthday Ena and Lily. More power to ya. Ena and Lily have gone through 102 years of good and bad emotions. They can show us all the important thing isn’t money or material things but sticking together as a family. God Bless them. well u 2 & may god gave u 2 to leave for long long long years & also have a nice day.may your smile be a light of happiness to all. well u 2 & may god gave u 2 to leave for long long long years & also may your smile be a light of happiness to all.enjoy & celebrate your life with joy & happiness like this 2 grandma’s.